The Ambassador program facilitates interactions between students and alumni and enhances the student experience by providing opportunities for networking and connections. The program requires a two-year commitment. Applications due by midnight on Monday, August 28, 2017. Apply here. Select volunteer opportunities for Classroom Placements this Fall 2017. Click here for sign up dates, times, and locations! You are invited to a Brown Bag Lunch with Dave Parrott, Ernesto Escoto and David Bowles. This is an opportunity to talk about issues facing campus, the First Amendment, and how to take care of yourself and colleagues throughout the semester. If you are interested in sharpening your public speaking skills, traveling the country, or just being apart of an exciting extracurricular activity, the University of Florida Mock Trial Team, the Liti-Gators, is the place to be. We invite you to attend one of our informational meetings on Monday August 28th and Thursday August 31st at 7:00 p.m. in Pugh Hall to learn a little bit more about our organization and to sign-up for an audition. All majors are welcome. For more information, please visit www.ufmocktrial.org or email us at litigatorsmt@gmail.com. Become a certified Project Learning Tree educator and discover hands-on, interdisciplinary activities that help students learn how to think, not what to think about environmental topics. Activities are easily incorporated into any classroom or program, and activities are correlated to state and national educational standards. Details here. We currently have 19 centers throughout the state of Florida and are expanding to Spring Hill, FL in Hernando County. This Career Fair is geared toward filling positions at our newest center – PACE Hernando. We will be meeting with potential candidates and conducting onsite interviews (walk-ins and scheduled) for the multiple positions open (administrative, counseling services, and teaching). Contact information here. AERA Dissertation Grants – AERA provides dissertation support for advanced doctoral students to undertake doctoral dissertations using data from the large-scale national or international data sets supported by the NCES, NSF, and/or other federal agencies. The selection process is competitive. AERA Dissertation Grants are awarded for one-year for an amount of up to $20,000. The next application deadline is Friday, September 15, 2017. AERA Research Grants – AERA provides small grants for faculty members, postdoctoral researchers, and other doctoral-level scholars to undertake quantitative research using data from the large-scale national or international data sets supported by the NCES, NSF, and/or other federal agencies. The selection process is competitive. AERA Research Grants are awarded for one or two years, for an amount of up to $35,000. The next application deadline is Friday, September 15, 2017. Please do not hesitate to contact me via email (grantsprogram@aera.net) or phone (202-238-3200) if you have any questions regarding our program. Study abroad programs have the potential to help students of all academic fields to develop global competencies within the context of their discipline in another country. The UF International Center invites all colleges and departments to attend the Fall Study Abroad Fair at the Reitz Union North Lawn on Wednesday, September 20th from 10am to 3pm. · UF study abroad program directors and independent program providers will have table displays and be available to answer questions. · Former study-abroad students will share their international experiences. · The UF Study Abroad Services staff will be available to explain the application process and to help students find the right program. 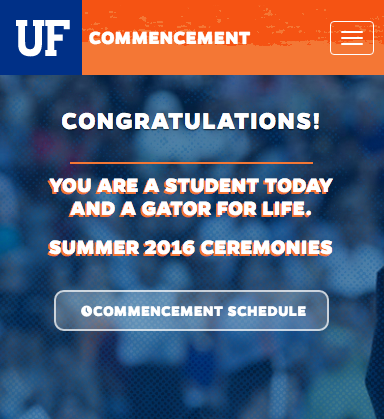 The International Center encourages prospective “Global Gators” to visit http://www.ufic.ufl.edu/sas/index.html or call Amanda Apatow at (352) 273-1539 for more information. Overseas internship opportunities are available. Study abroad can be used to satisfy summer residency requirements and most financial aid can be used! A Two Day Symposium at the University of Florida featuring Keynote Address by Dr. Mary Dalton, From Heroes to Hacks: The Disturbing Rise of Bad Teachers on Television. Please see attachment for additional details. Join the Citrus County School District team where learning is the expectation and caring is a commitment! We are currently hiring elementary and secondary teachers for all content areas. Additional details attached. Evinston United Methodist Church is located in Evinston, FL, a small community less than 15 miles south of the University of Florida. Evinston UMC is a small family based church. Our Sunday attendance averages about 75 people. Our nursery consists of children from infant to kindergarten ages. We may have as few as 1 or as many as 10 children in the nursery on any given week (we always have youth willing to help if the number of children is too large for 1 person to supervise). Contact information and other details located here. Lafayette Middle/High School has an opening for an Assistant Principal. Interested candidates may apply on line via the district website. Attached is a brief position description and other related details. 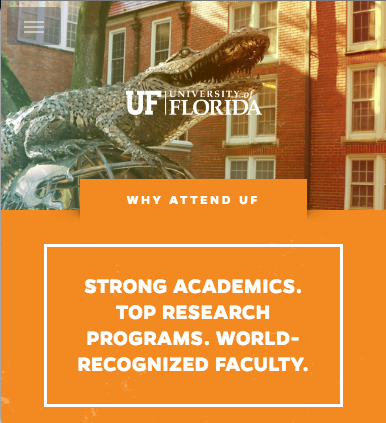 We are looking for an articulate, confident, self-motivated, personable, productive person to aid the UF College of Education (COE) Development and Alumni Affairs Office (DAA) at Norman Hall. This is an administrative support position that has a high concentration of event assistance. This is a part-time position that will be required to work 20 to 30 hours per week between the hours of 8:00 AM to 5:00 PM, Monday-Friday (occasional nights and weekends with advance notice). Additional details here. Our team is growing! Gainesville’s premier preschool, owned and operated by Gator grads, is now hiring! We have full time and part time positions available. Applicants should be hard-working, dependable, caring, nurturing, a team player with a positive attitude, and be comfortable communicating with children, parents and peers. We are seeking highly-trained teachers (A.A., B.A., or C.D.A, 45-hour, CPR, and/or 1st Aid are a plus)! Positions to commence immediately. 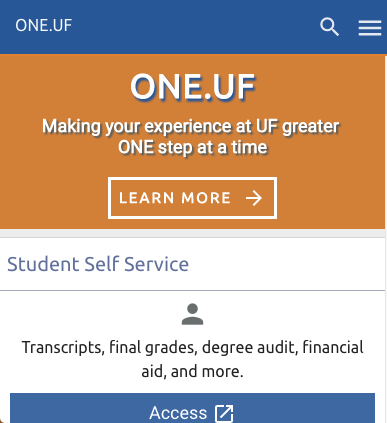 Employment opportunities are available for qualified UF students to tutor and mentor middle and high school students. · Salary is $10.50 per hour. Tutors will work 12-15 hours per week from approximately 3 pm to 6 pm. Tutoring sites are on campus and in the community at Reichert House and Howard Bishop Middle School. · Related duties include occasional test prep sessions, parent meetings, and field trips. · Each tutor will have a small core group of families to maintain contact with and update information on grades, etc. Please contact CROP Coordinator, Diva McPherson, J.D. at dmcpherson@coe.ufl.edu or call 352-284-1787. Currently seeking a part-time Advising Specialist at the Blount Center. This is a great position for a graduate student who needs some extra income and hands on experience while completing their education. Click here for details. The College of Education Business Office is seeking an undergraduate student assistant to provide clerical and administrative support for the Fall 2017 & Spring 2018 semesters. Duties will include but not be limited to: document sorting and distribution, data entry, document imaging, filing and making copies, and providing excellent customer service. Interested applicants must have unmet financial aid need, availability to work 10-15 hours per week Mon.-Fri., and be enrolled at least ½ time for the fall and spring semester. Hourly rate of pay is $10.00. To apply please email a resume and copy of your current course schedule to ellenyoung@ufl.edu. The Child & Youth Program at Peaceful Paths is looking for interns and student volunteers for the fall semester. Internship posting is located here. Peaceful Paths is also looking for interns and volunteers all year round. It would be a good fit for anyone who is interested in getting experience in programs surrounding domestic violence/dating violence. If you have any questions, contact Cassie Gaspard with Peaceful Paths. Her email is cassieg@peacefulpaths.org. Cassie also shared that interested individuals can visit their website to learn more: http://www.peacefulpaths.org/get-involved/. The Gator Junior Golf Association is a non-profit youth development program that focuses on teaching life skills to children through the game of golf. Our organization is looking for volunteers to help coach and mentor children in the Gainesville community. Only basic golf knowledge is required. If interested, please email Tori Look at gatorjuniorgolfassociation@gmail.com, and attach a copy of your resume and a brief statement explaining why you think you would be a good coach. We hope to see you on the range! Balance 180 is a local non-profit organization that focuses on integrating children with varying abilities through sports. Our volunteers work 1-1 or 2-1 with our athletes who have disabilities including autism, Down syndrome, ADD/ADHD, and cerebral palsy, among others. This is a great hands-on learning experience for student volunteers. 1. Adaptive Gymnastics Classes- Saturdays, 12:30-1:30pm. This is a gymnastics class that is specifically designed for children with varying abilities. We set up the gym in rotations that include vault, bars, beam, floor, and tumbletrack, so our athletes can work on a variety of motor skills. The athletes have a range of disabilities including autism, Down syndrome, ADD/ADHD, and cerebral palsy. Information can be found here. If you are interested in being a part of the Adaptive Gymnastics volunteer team, please contact Ashley Tringas at balance180adaptivegymvolunteer@gmail.com. No gymnastics experience is required to volunteer. children ages 2 to 7 years old. Athletes work on social skills plus basic motor skills for all sports, such as relays, kicking, hitting, jumping, climbing, and much more! Information on this program can also be found in the flyer below. balance180volunteers@gmail.com. No gymnastics experience is required to volunteer. Extreme Dance Company is a dance group committed to bringing a creative breath of life to UF! Interested in joining a fun student run dance company? Free to join and open to both undergraduates and graduate students. Practice is one time a week for the duration of the semester and at the end of the semester there is a performance in the Phillips Center for Performing Arts. Details here. 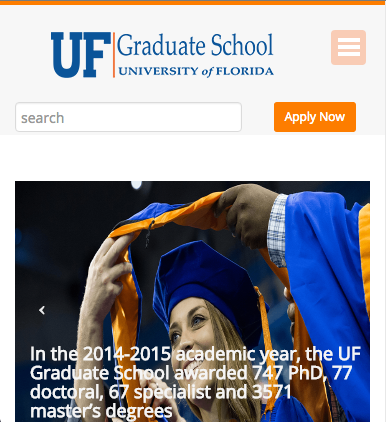 UF faculty member looking to hire a reliable person to help during late afternoon/evening on Mondays and Thursdays (5 to 8:30 pm). Additional babysitting opportunities possible on weekends and into the next semester. Duties include picking up my 10-yr old girl and 7-yr old boy from school and driving them to sports activities or to home and help with homework and housework at home (emptying dishwasher, making lunches for next day, etc.). My children love outdoor activities and having someone to play games or read a book with. Requirements: Prior experience as a babysitter/nanny, safe driving record, good references, non-smoker, and reliable car. Experience providing transportation for children is a bonus. Contact Andrea Dutton at andrea.dutton01@gmail.com if interested. My daughter is a 5th grade student who struggles with reading comprehension. I have tried several agencies, however her reading scores are at a 3rd grade level. I would be extremely grateful if you all had a tutor that specializes in reading comprehension that may be of assistance to us. Feel free to contact me via email or phone (352) 494-4044. I am looking for someone in the College of Education to help a freshman in High School get oriented to High School life. I need someone to help with organization, homework, as well as studying for exams. I would like Monday-Thursday sometime after school for an hour. If interested, please send an email to tiffkmon@gmail.com and I will contact you. I am looking for a tutor for my ten year old granddaughter to help with her reading, comprehension, and other skills needed for the fifth grade. I really would like to have someone who will make learning fun, and will in turn build her confidence in the classroom. Female tutor only. If you have any questions or concerns please contact me at 352-378-2115 (home) or 352-213-0002 (cell). My friend and I are looking to share a caregiver for my 22 month old son and her 24 month old daughter. They’ve been sharing care for over a year and get along splendidly. If interested, please contact Oaklianna Caraballo at (352) 283-9830. I am looking for a reading coach for my seven year old son. He is going into the second grade and was just diagnosed with a reading convergence and tracking issue. We are working with an Ophthalmologist to get the issue corrected. I would like to give him a push in the right direction with strengthening his skills in reading. Please let me know if you have anyone available for tutoring. Please contact Ashley Lentz-Black at lentzblackah@gm.sbac.edu​ or 352.278.2727. My name is Ms. Head and I am looking for a tutor for my child. She is going into the 5th grade and struggles in reading and a little in math. I would like to have someone twice a week for a hour to a hour in a half. If you are available, please give me a call as soon as possible (352) 792-7754.